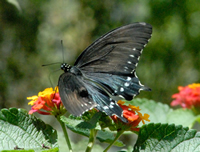 Insects > Butterflies > How Long Do Butterflies Live? There is an average life span of a butterfly - it is usually about one month. Although the smallest butterflies that you can usually spot feasting on the flowers in your front yard will usually only live about one week. Mourning Cloaks, some tropical Heliconians, and Monarchs are some of the only butterflies that have an average life span of about nine months. Now as many of you know, butterflies are cold-blooded creatures, so there is another factor to take into consideration when you are dealing with butterflies; the climate. For instance, if the butterfly egg has been laid just before the cold weather hits, the egg will stay in egg-form until the weather warms and as soon as it does, the caterpillar will hatch and everything will start again. If the butterfly is an adult butterfly and the weather starts to turn colder and they did not migrate south, the butterfly will hibernate somewhere until the weather warms. What this means is that a butterfly could technically live for many months past the average life span, it all just depends on the climate and what stage of live the butterflies is in when winter comes. There is also a difference between how long a butterfly would live if it was not living in the wild and how long it will actually live. Butterflies in the wild are exposed to many predators like birds and other insects, so may not live as long as they are capable of.